In stock -This product will ship today if ordered within the next 1 hours and 48 minutes. 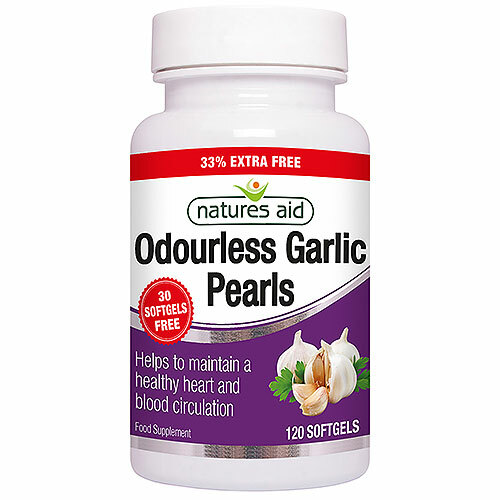 Natures Aid Garlic Pearls each contain garlic powder which has been specially prepared to remove its familiar garlic smell and does not leave any after-taste. Natures Aid have been manufacturing and supplying quality nutritional supplements to the independent retailers for 30 years. Their Philosophy has always been to provide high quality, effective nutritional supplements to help preserve and maintain optimum health. Soya Bean Oil, Gelatin, Glycerine, Silicon Dioxide, Odourless Garlic Powder. Take 1 softgel per day with a cold drink. Do not exceed the recommended intake. If you are pregnant, breastfeeding taking any prescription medications or have a medical condition, consult your healthcare practitioner before taking this product. A very small number of people have been known to exhibit hypersensitivity to garlic. People taking blood thinners should consult their doctor before taking garlic supplements, as it may increase clotting times. 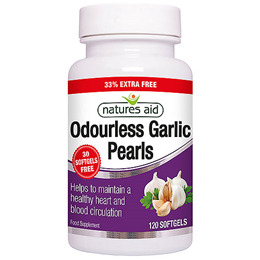 Below are reviews of Natures Aid Odourless Garlic Pearls - 120 Softgels by bodykind customers. If you have tried this product we'd love to hear what you think so please leave a review.